A former restaurant manager who had just purchased his own diner in Perrysburg, Ohio is now trapped in South Korea after he was prevented from returning home to the United States. Don Yi flew to South Korea on Sunday to handle the affairs of his recently deceased father, WTOL reports. Much to his shock, however, he was prevented from boarding his flight home from Seoul on Wednesday. “They had put a travel ban on me, and I didn’t know why. No one knew why. But I found out it was the Seoul police,” he was quoted as saying. According to Yi, he learned that the South Korean government had issued a warrant for his arrest years ago for failing to undertake mandatory military service when he was younger. South Korean law requires all Korean men between the ages of 18 and 28 to serve two years in the military. Yi, who is now aged 40, moved to the U.S. when he was nine years old and grew up there. As an adult, he served eight years in the U.S. Army, including two tours in Afghanistan. While U.S. citizens are granted waivers, the South Korean government argued that Yi did not express his decision to remain in the U.S. when he turned 18. 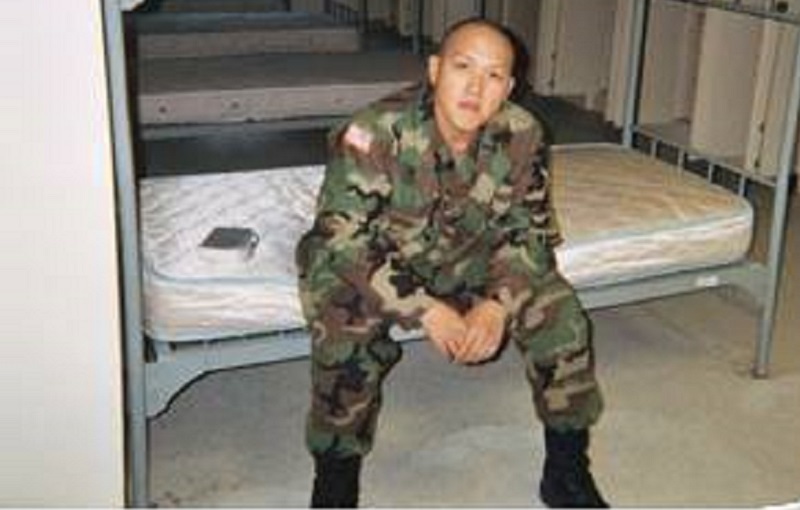 “I went to the police station on Thursday, and they told me I hadn’t reported to the Korean military when I was 18. I was arrested then and there,” he said. Ironically, he was even stationed in South Korea at different times during his time in the U.S. military. Yi was released that day, but since he has no car in Korea, he was forced to walk the streets of Seoul for miles trying to find someone to help. Speaking with the news outlet, Yi’s mother, Sung Kim expressed frustration about the whole ordeal. On Jan. 1, Yi purchased Tea Tree Asian Bistro, the restaurant he has been managing for three years. In his absence, his sister Kim had to take leave from her full-time job to keep the restaurant open. Since Yi posted a plea for his predicament on Facebook, many have expressed support for him and his family. Kim said well-wishers have been sending their encouraging words of support over the phone and social media. Yi does not know if he will be able to continue to support himself if he is forced to remain in South Korea for another month, as he is already running out of money. A GoFundMe account, set up by a family friend on behalf of Yi on Friday, has so far reached $2,390 of its $15,000 goal with the help of its 59 backers as of this writing. 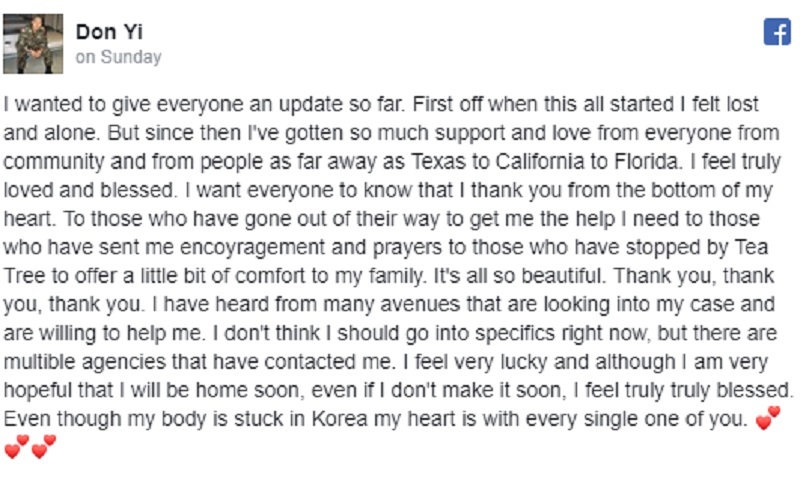 In a recent Facebook post, Yi thanked everyone who reached out to help him and his family. “Even though my body is stuck in Korea, my heart is with every single one of you,” he wrote.